Fuerte Amador is an anchorage port, passengers transfer to shore via ship's tender. A new pier is under construction. The port of Fuerte Amador is located right at the Pacific entrance of the Panama Canal in the Pacific Ocean. It is made up of a one-mile causeway extending out into the Pacific Ocean and connecting four small islands in the area, Flamenco, Perico, Culebra and Naos. The causeway includes the cruise port, marina, the Fuerte Amador shopping and restaurant plaza, a convention center and a second shopping and restaurant plaza. 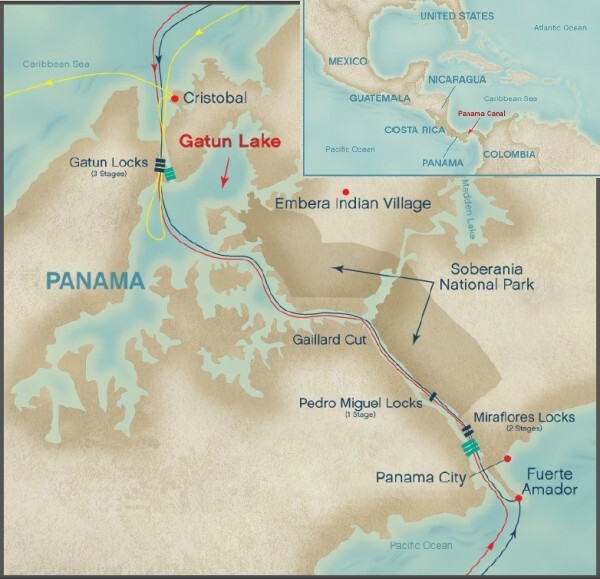 The port is twenty miles from Panama City center. Private taxis monitored by FARM are the only transportation allowed inside the port area, while local taxis have to remain outside the Island entrance. Due to strict rules by the taxi union, shuttle buses to the city are not allowed. Be aware that taxi services accept U.S. dollars, but be sure to agree on the fare before leaving the port. Hop on/off bus stops right near the tender dock. Tour takes 2 hours, every 60 minutes. Do not venture too far away from the bus stops, best to just stay on the bus and enjoy the vistas. For safety reason ship's tours are recommended as public transportation is not very safe. Taxis are also a decent way to get around in Panama. They're not expensive at all. A three-hour tour is about $90 per taxi. If you have the whole day, and haven't booked anything for Panama City, and want to do your own thing, you can get cabs in Amador for around $15-20 an hour. The Miraflores Visitor Center is only interesting for those who do a "partial" cruise. Try to reach miraflores locks around 9am -10:30am or 3pm -4:30pm. If you do the "full canal" you will see everything much better from your ship. Traditional Panamanian crafts can be found most cheaply at artesian markets. In Panama City, the best are found at the market in Balboa, with the Panama Viejo market coming in as a close second. Panama's best-known craft is the mola, intricate reverse-applique handwork made by the Kuna. Molas can be bought at either of these craft markets, or from vendors on the seawall in Casco Viejo. In Fuerte Amador you can find the Fuerte Amador Mall, which is a large duty-free shopping plaza. The mall sells a variety of quality items at rock-bottom prices. Examples of goods that are available in the mall are electronic gadgets, jewelry, food, perfume, and clothing. Fuerte Amador is also home to Flamenco Shopping Center, which is a shopping plaza that houses a number of boutique stores, souvenir shops, and restaurants. There is also a newly built modern shopping center in Flamenco Island. One can find a number of specialty shops and stalls in the marina that sell local products such as native handicrafts and souvenir items. If you ship is arriving in the evening: look for a restaurant with a good view of Panama City and enjoy!